Open multi-function trolley in modern design. With soft-close drawer and cable passages. Closed multi-function trolley in modern design. 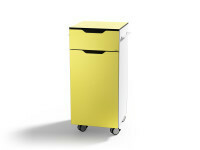 With soft-close drawer, cable passages and 2 handles.